March 2010 was a bad month for me. My husband was unemployed. It had been exactly 20 years since my beloved mother’s death. My house had been broken into. They stole my money and my car. And to top it all off, my husband and I abruptly and unexpectedly separated. I was physically, emotionally, and economically spent. Yes, that month was a stinker! I was working full time, but still could not afford to stay where I was living. I have a big dog, Cassi, and the thought of moving into an apartment with her made me want to stick my head in the sand. What was I going to do? My good friends, James and Tanille had recently downsized into a small trailer that they had beautifully renovated from the ground up. Tanille’s parents had done the same thing a year or two before them. I loved both their homes, and knew that this was my answer. The timing was perfect – a 1958 pink (yes, pink!) single-wide trailer was for sale in their little trailer park for $5,000. It was hideous! Dark brown paneling, stained and ripped flooring, chipped tub and sinks, cracked countertops, disastrous lighting…. It was perfect! I had two weeks to make this 450 square foot aluminum tube livable. My wonderful friends helped me around the clock – sorting, organizing and selling my things, painting every interior surface of the trailer, replacing all the flooring, and moving me in. For the next several months Cassi and I, and the pink trailer began to heal. I hung new lighting and installed new fixtures. I grieved and mourned my old life. Countertops and sinks were replaced. I remembered that I liked to live with just my pup and if we wanted to lie around and eat popsicles all day, no one cared. I organized and decorated and added finishing touches. Cassi and I took up running, and ran till our feet hurt. I learned to live simply, and embrace a small space. I mended my heart through the therapy of friendship. I built a fence and planted some flowers. I made the decision to look to the future with hope and joy. It’s not always easy living in a trailer, and in a trailer park. There is a stigma attached that only a certain type of person ends up there. And I have neighbors to prove that is true. But I also have neighbors who really care about their home, and make it beautiful. And a sense of humor helps. Now, when asked where I live, I say, “A pink trailer in the ghetto.” People awkwardly chuckle in response, but the moment I bring them inside my home it’s always the same reaction – “Wow! I can’t believe this is a trailer!” I love my trailer. It’s exactly how I envisioned it. I would not have been able to afford the changes I have made if it was a larger space. The size of my home forces me to live a simple life, unencumbered by too many unnecessary things. My life isn’t perfect. The pink trailer and I are still on the mend, but Cassi and I are very happy. Sorry it was hard to get there, but I hope it continues to work for you. It looks great! I bought a similar ceiling light fixture for my kitchen from Ikea. It used five 50 watt GU10 halogen bulbs, for a total of 250 watts. They got incredibly hot and needed frequent replacement. I replaced them all with a mixture of one watt and four watt LEDs that are so cool you can keep your hand on them while they are on. Now it uses a total of 11 watts and I haven’t had to replace a bulb in over two years! Over the past 73 years I have lived in a number of “house trailers” (called “mobile homes” now but they are still house trailers) and I have never been ashamed of it. In that period of time I have owned a few houses but the homes I value in my memories are the trailers and house cars (they call them RV’s now). Currently I live in a converted 1951 GMC highway bus that once carried passengers El Centro to Oregon as Greyhound Lines, Inc. It gives me a 240 sq ft of living and plenty of storage in the baggage compartment. I have use of the 690 sq ft house but that is really my spouses place as the bus is completely stand alone. I have had this bus for 33 years and do not desire anything else. I am in a neighborhood with lots of people that are classed as “trailer trash” by people that live in houses owned by a bank because they choose to live in a trailer they can afford. I have thought a great deal of what I would do if the bus was lost due to unfortunate events and the solution is always “get an old trailer” and press on. Being on family property and in a wealth deprived area many problems are avoided as I am considered just some of that “trailer trash from the ghetto”. how did you do it? I don’t know anyone who can help so Im on my own. Can you tell me where you bought your furniture? Was it hard to put everythin gin place. it looks lovely and may be my answer. I did have a lot of help, but if that’s not an option you can google tutorials on YouTube for step by step instruction on a lot of the easier or more asthetic renovations. Also, your local hardware store may offer free classes or instruction. Most of my furniture is Ikea, clearance from furniture stores, or second-hand items. Everything I have now fits perfectly, but I got rid of over 75% of my belongings before moving into the trailer. Alos, see if there is a Habitat for Humanity store in your area, as they are a great inexpensive resource for material. Your new home looks AMAZING! You’ve created a very comfortable, liveable space for yourself. Frankly, I find your trailer much more appealing than the 3000-square-foot McMansions so often featured on HGTV. Kudos to you for turning lemons into lemonade! Gorgeous! A good friend of mine lived in a lovely single-wide trailer for many years. 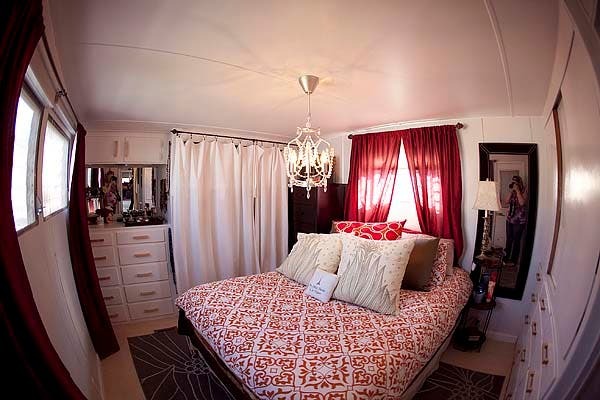 By making a few enhancements (interior paint, artwork, a garden) he turned a boring trailer into a lovely living space. Just like Rebecca has. Thank you so much! I hope all goes well for you, and you are able to figure out what you need to do. Simplifying is one of the best things I have ever done, and it has improved so many areas of my life. This is exactly what I want. Beautiful, just beautiful. That you were able to pull this together in two weeks is amazing. My congratulations to you on your wonderful new home (and for having the strength to bravely deal with all of the pain and trouble you have faced). What a lovely home and inspiring post. I have a technical question: How do these larger trailers do with condensation? Do they have exterior venting built into the wall structure? I have been learning about RV trailers recently (just restored a little one from the 60’s). I also live in the Pacific NorthWET. Any home with a metal shell here needs special attention or it becomes a mold-bomb! Anyway, you did such a nice turn to that little house. May many good memories unfold there! I’m fortunate to live in the Nevada desert, so even with a swamp cooler and the occasional rainy day, condensation is not a problem for me. But from what I have heard this can be a problem in a moist climate. Interestingly the older mobiles are better equipt to deal with the moisture, as they tend to be drafty and not air-tight (as is also the case for me). I would do a little research on-line, and maybe even talk to some local RV companies and see what others in your area are doing to avoid condensation problems. Abel- I live on the Redwood Coast of Northern CA, and it is quite damp here. I have a friend who went through a similar story (divorce and such) and she lived VERY stylishly in a single-wide in the woods. Mold did not seem to be an issue; not sure if that is because of the way they are made, or if it was because it was well-heated and that kept it at Bay (?). I am familial with the stresses associated going through the experiences that served as your springboard for this wonderful home you created. Thank goodness you had the support of friends and Cassi too. I really like the look, functionality, and homey place you turned your funky pink trailer into. It was the right choice, ….not trying to hold onto a bigger house with its associated costs and possibility of foreclosure. You did well Lady….Blessings for the future! Gorgeous home – and homes take a number of forms regardless of how society chooses to view some of them. I’d rather have a friend in the trailer park than a McMansion. I hope the stigma for that lifestyle one day eclipses the one for trailer parks! I really liked trailers but I absolutely LOVE yours! I could actually see myself living in one now, I want to downsize so bad but really need to wait until my college aged daughter is on her own and now I might just have to look into buying a single wide trailer. Thanks for the inspiration!!! I love your home, very cozy yet inviting. Sorry for the reason but dogs make life more bearable, don’t they? Marvelous! I’ve gone thru a lot of changes too, and have lost almost everything. Being poor gives you a certain perspective. Now, being able to live in a trailer like this would be almost HEAVEN. I love your space! I grew up in a 10×57 trailer in Vermont in a family of four; now living in Phoenix there is indeed a certain stigma in trailer park living but back in Vermont there are some really gorgeous ones because no one builds tract homes, building one home at a time is expensive and especially seniors don’t want a 100 year old house to have to maintain. My mom and her husband live in a nice place right at the foot is Mt. Ascutney, which has hiking and mountain biking trails all over it as well as a ski area. I’m thinking of buying one there myself, and your amazing transformation got me so excited about it. Thanks for sharing; just amazing. Simple is GOOD! Less is MORE! You may like to read Voluntary Simplicity by Duane Elgin? I suggest it. My husband are in the process of selling our home and 4 acres in Central Texas. And find land here in Northern Minnesota and live off the grid!! Oh how the wilderness HEALS!!! I’m a firm believer! I was raised in Texas. Never lived any where else until I was healed from a massive stroke that left me paralyzed on my left side,the cause was surgery removing a tumor off my coratid artery in 2002.Then in my recovery process my marriage of 24 yrs fell apart.When he found some one else.. You cannot see any effects from the stroke.it’s been 10 years. Ive been remarried for 4 years this month on July 6. He gre up in Madison,WI. We moved to WI to find work,ended up here in Ely,Mn, I can’t tell you how much peace I have being with my best friend!! He has made up for all the abuse I endured from my 1st spouse… And I give God all the glory for restoring me and making me to be a light to others of his love and healing. I was raised riding horses,sheep and angora goats… loved it… I was also a patrol deputy when I had my surgery,my dad was county sheriff in the early 1950s before I was born. Oh the story goes on… I will spare you! The Lord brought us to this place and we will be spreading the Good News by living as Jesus taught in the Gospels… May God Bless you and give you Peace and keep you strong! I completely relate to your story! Tragic things have a beautiful way of making you reevaluate what is important. I have been renovating my 15′ 1969 Land Commander Trailer and I love the idea of having this backup place to live that is all mine. Although I live in a house now, I have been unemployed since last year, just started my own business, and racked up some medical debt due to a chronic condition. The uncertainty of my situation has me longing for the simplicity of off the grid living and freedom from the cycle of debt our society indentures us to. My husband and I lived in an 18 ft Holiday Rambler travel trailer for 18 months while we put money towards building our house. It was well worth the $300 we spent to buy it. Nothing worked in it at all though so we had to carry water and run power using extension cords. We toughed it out though.It was a great way to cut costs. What a beautiful home, and pink! It’s gorgeous! You never need to be ashamed of where you live, even if it isn’t what others would choose. I had an entire year like your March 2010 (could not wait to see 2001 leave) and I empathize with what you have gone through. All the best to you in the future- you have made a good start. Wow! It’s really beautiful! What a magnificient recovery from all that hit you there. Rebecca, I love your home! Thanks for sharing! Thank you for sharing your story. It’s truly inspiring and lovely. What an amazing job! You have a lovely home. beautiful! I love it! On a side note, thank you for deciding to keep your pet when your life circumstances became difficult. I work at an animal shelter & see too many cases of people giving up their pets because they’re moving, had a baby, got a divorce, whatever. Pets are great stress relievers, so I’m sure she’s a big comfort to you! People judge by outward appearances but your home clearly has the heart of a castle! Your story is very inspiring. I really do think the human mind is more flexible than most people think. Happiness comes from inside you (and of course, a dog does make things better) Good luck with the healing process, you’ll get there, for sure! Inspirational! That is the coolest kitchen and one really adorable dog, too. You’re on the right path. I spy a Ridgeback!!! Mine also wouldn’t be too happy in an apartment without a yard. Your home is beautiful!!! WOW! Love it – where are you located? I recently moved back into the trailer/mobile home that I grew up in – it’s a 10 X 55 Smoker Aristocrat and I love it. I’m lucky I own the land the trailer sits on it’s about 1//2 acre. Hopefully will soon have a guest house here on my property – which will be a tiny home 8 x 18 similar to the wee rose cabin that is sitting out in vermont. Congrats on the awesome job you did renovating your home. Thank you, Patty! I live in Reno, Nevada. And I’m in a little trailer park of just 24 sites – all small single-wides. Thank you for sharing your story with us. Your home has real spirit! It looks like a real home as opposed to just a house. It looks loved. I too have had rough months and rough years. It says a lot about your character that you dared to dream a good life for yourself (and your dog) when so many things were still in pieces. I hope 2012 is a much better year for you! Wow, just wow! Love this. And–PINK!!!!!!!!!! Seriously, you could probably have a new career as an interior decorator or consultant. Your house is beautiful! Thanks, Patti. All the best in finding exactly what you are looking for! I’m so proud of you….. Your good days will have already outnumbered your bad days. Enjoy your paradise and never forget how fortunate you are right now. Nicely done! Not a tiny space but a practical one! I’m living in a 1958 Airstream 22′ right now but plan on getting some land and a park model within the next couple of years. You’re part of the fastest growing ‘minority’ group in the US, single women over 40. In fact if the demographers are correct, single person households will outnumber family households by 2025. Maybe then we can get some relief on our taxes! 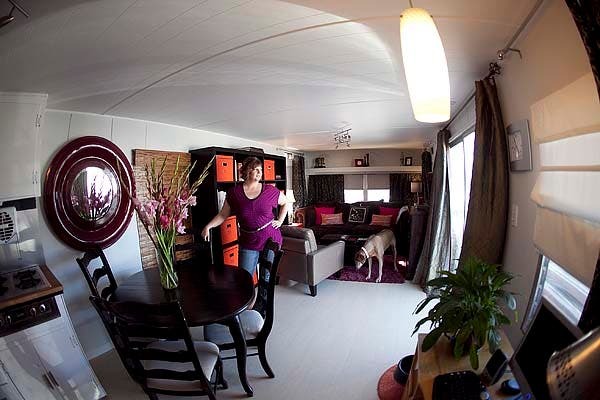 Wow- you did a great job renovating both the trailer and your life! I visited your website and enjoyed it very much. You talk about a swamp cooler… did you buy one or make one yourself? I love posts like this because it makes the transition to living small seem so much more do-able! The swamp cooler came with my trailer. I had to replace some belts last year, and the motor was just replaced last month. 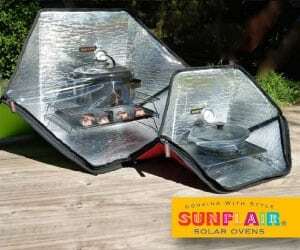 Being in a trailer is like being in a greenhouse on really hot days – always hotter inside than out. So on days my swamp cooler broke down I had to improvise by blowing fans over bowls of ice. Not a perfect solution, but it did the trick. I LOVE it! You are awesome! Wow, Rebecca! This is a beautiful home and a very beautiful story. I also really liked the all of the photographs, especially the photograph of Cassi and the potted plants. I wish you the best. WOW! I am with Anne, Torie, Mary and everyone else here. It is GORGEOUS! You are such an AMAZING INSPIRATION! I love where I live, but the folks here may be selling and whenever I peruse Craigslist, I get so depressed. I hate apartments and I don’t want to live in the city. I too have a big dog, a sweet Saint Bernard, along with my pretty Ragdoll cat. Funny enough, one of my best memories is when I lived in a mobile home out in western Kansas. I loved living there! After reading this, I’m going to look for some land near here and see if I can find an inexpensive trailer to fix up and make as pretty as yours. THANK YOU! “GO BIG or GO HOME”! Honey, you went BIG and you are HOME! I am sorry your ex-husband lost the best thing of his life…cuz girl, you ROCK and your puppy dog does too! Awesome story, Very inspiring. Hope to someday follow your lead. I love it! My question is where is it parked and what does the monthly rent cost? How did you find a decent park? I live in a small trailer park that has just 24 sites. My space rent is $375/month. I was fortunate that I already had some friends living in my park, and I knew the owner and manager. I would look for a park that requires a more in-depth application process. That’s what ours has and for the most part it has kept the seedier people out. Excellent renovation and inspiring story. I could live proudly and happily in a comfortable home like yours. All the very best to you and your dog. Thank you for sharing! Excellent, down to earth solutions for living real life. beautiful…..you are with your beloved dog and that is all that matters…..and who cares what others think…they dont know what life will bring…so not good to judge…..enjoy your wonderful new home…. You have done a wonderful redesign and I really admire your spirit and creativity. I believe that you are agreat example of how to respond to what happens when our lives take a turn in directions that we didn’t plan! This is an AMAZING story!! I am in love with this trailer – you did amazing work making it beautiful, cozy, comfy and functional. You most definitely made a house a home with this trailer and have NOTHING to be ashamed of!! GREAT JOB! Thanks for sharing with us! My first husband and I lived in a one bedroom trailer in Everett, Washington with our first child. We bought it for 5,000 after the owner had died in the livingroom. After cleaning it, installing new carpet, which by the way was totally cheap being that the trailer was a 10′ by 50′. Built in 1959, it had some cool accents like the wood framed glass door which separated the kitchen from the “hallway”. I loved that trailer. I am four children raised and two divorces later and considering downsizing and living in a small space. I love your idea! Beautiful trailer…love it love it….you did a great job…..so cozy! I am supposed to be working but I took a minute to browse and not sure how I came upon your article, but omgosh, it is wonderful. Your story is mine, and after being a wealthy housewife in a prestigious community I am now a trailer chic and I was one of the snobs that used to laugh about trailers. Just goes to show, don’t ever judge-God will send it right back to you. Doesn’t matter for me though, because this is one of the best things that has ever happened to me. I have grown emotionally, I have a home and I have met wonderful others in the same situation all trying to get by. My 12×60 with attached sun room is a real live dump, but I have plans and I truly believe that it is better to salvage an old metal heap and make it lovely than have it rot forever in the earth and add to our planets demise. I am truly grateful to have landed where I can actually afford the rent ($440 mo) and I can have my pets. Keep up the blog, it is very helpful because in my old park, there are two other single women exactly like us. Same story, same trailers. We are really on to something here. Take care and you have a devoted fan. It is so sad that there is a stigma to living in a trailer. My husband and I bought a airstream then a motorhome. I love living small. I can have my dogs, rent is very cheap and we can put away for the homestead we dream about with a Pioneer cabin or vintage trailer (wink wink). Beautiful trailer. Amazing job. All the best with your renovations! And I agree, the freedom of living within your means is hard to beat. How exciting that you are getting what you need to fix up your place at little or no cost. If you have a Habitat for Humanity store in your area, check it out. I got a lot of supplies there for a tiny fraction of what the hardware stores charge. I lived in a mobile home for years…as a young mother, as a college student, etc…and was often mortified when someone would ask where I lived. I’m older, wise, and a site-built homeowner, and I am MISERABLE. I miss the days of hating my neighborhood, and being able to relocate my ENTIRE ABODE. I had FAR less maintenance, and honestly, I can say that my MH wasn’t old enough! Yours is BREATHTAKING! My dream is to get OUT of this house, buy an older mobile home (or an Airstream! My dream home!) and put it on a piece of land so I can surround it with my tropicals (I grow Aroids and Bananas). You’ve given me the inspiration I need! By the way..My mother lives in a “trailer” and is a 1/5 partner in a 2159 acre farm! Trailer trash? She’ll grin when you say it! You have done an amazing job…it’s amazing what WOMEN can do when they set their minds to it! Wow — its beautiful, functional & all around just perfect! Congrats on making lemon aid from lemons. All the best of luck to you. I forgot to add that I don’t have one penny to start renovating, but I have put requests on Craigs List in my community and I have received EVERYTHING I have asked for and needed for free. I even had a paining contractor give me 50 gallons of white paint in all different types, outdoor, indoor, enamel, flat,etc. Roof repair, caulk, etc. My latest venture is I found some old plywood for free, so I am going to take some of the nicer paneling down and use if for floor covering, yes I said floor-covering, until I can afford the laminate I want (the grease stained carpet just has to go). The old plywood will replace the old paneling and I am going to paint it. I am doing my own colors with some old acrylics in tubes I picked up at a garage sale. I have come up with some very modern colors when added to my free white paint. The pattern of the paneling is actually quite lovely, a knotty pine type of deal and I am going to seal it and call it a floor for a while. I have an old zebra rug to throw over it and I think it will be smashing with my sea grass sectional couch of which I am covering the cushions in white microfiber. We shall see. That is so amazing and interesting. I’m curious what section of Craigslist to use for such requests. Thank you so much for sharing such a wonderful idea! Can’t remember where I saw it but somebody cut up plywood into “planks” for their floor. It looked really good, almost as nice as actual plank flooring. Probably be a lot less work than switching out the wall panels for flooring, possibly more durable as well. You can paint or stain the floor and do all sorts of decorative stuff. Someone else did paper bag floors too, looked kind of like leather. 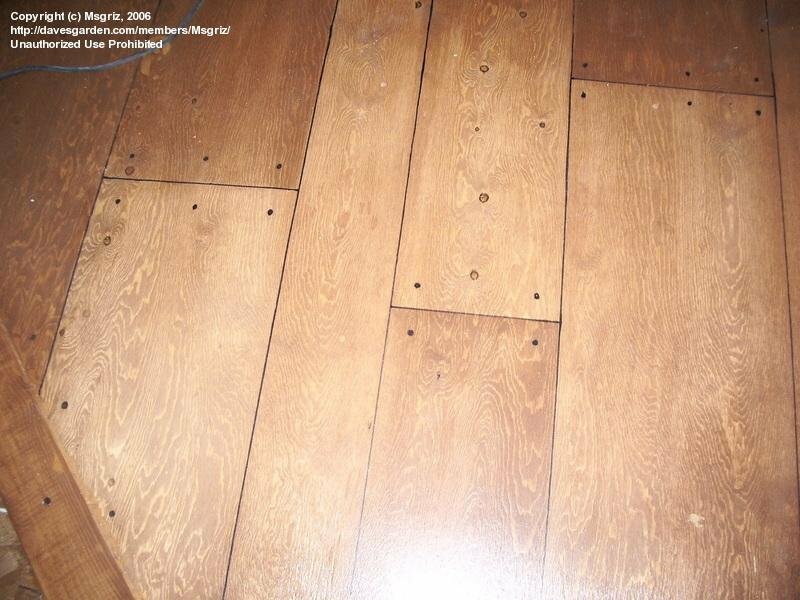 If you go to Pinterest and check out floors some interesting options pop up. I have seen a really wonderful “paper bag floor”- the artist who installed it also added painted areas, plus interesting cut-outs of birds and butterflies and plants. It was gorgeous- coated with varathane, I think, and held up really well. You’re welcome, Fran! The encouragement is really mutual. Making a change is so hard at first, but if it relieves you from stress and difficulties it is so worth it. And a veggie garden can be started again. Even if you don’t end up with much of a yard, I’ve seen some beautiful pictures of growing your entire garden in pots and planters. I think you’re amazing, and your home is beautiful! Truly, you’re an inspiration! Beautiful! That belongs in a magazine! I love what you have done with your sweet trailer. Most of all I love that you had the courage to it. You have given me a new hope! I paid $5,000 for my trailer, and put about an additional $5,000 into it over the following year. My wonderful uncle loaned me money for the purchase and renovation. A couple of my neighbors found old, run-down mobile homes for free and then renovated (although their renovation was more extensive because they had to gut it). So it can be done for a little less than mine. If you are interested, look on Craigslist under the free section, or just drive around some local trailer parks to see what is out there. Just stunning, like you and your pup. You have much to be happy about and proud of (though definitely you’ve had some trying times). Thanks for sharing your precious story with us. You have a decorating gift too! I really like what you’ve done! The high end finishes make all the difference in the world. I lived in a 14×70 trailer in a trailer park when I was first married. I plan to go back to one some day… Your dog is awesome as well! I’m sure he’s been a good listener for you! I love what you did with this trailer. I am trying to find a cheap travel trail so I can fix it up just like you did. I think it will be a awesome project. You are an inspiration to me! I lost my home and business in the economy downturn and am living with my mom and after 36 years, gone back to school to start over. I have been dreaming about a tiny home for a long time. I go back and forth about saving up to build something or buy a trailer. You have renewed my faith that a trailer can be fashionable and comfortable. Now if we can just have trailer parks to match… it would all be good. Thank you for sharing! Love it…so creative and great use of space. I hope you are very happy now. Life has a way of turning us around and we end up going in all kinds of crazy directions, it’s how we deal with it that counts. From the depths of ugliness to a beautiful woman and a beautiful home. Just like Cinderella, hopefully you will find your Prince Charming. You did an amazing job with both. Thanks for sharing. i was also very happy to see this this morning in my gmail account…i too, have been going through a tremendous hard time, and one that is turning me inside out emotionally, in order to make me a whole person again…i too, was robbed last winter and lost everything, and then the job i had had for years and SO loved, let me go…i’ve had to move to another town, and am living in a tiny apartment with my daughter…her man is coming to live with her, and i feel i need to begin my own life, but don’t know where or how to start, im so down…i like these tiny houses blog that ive discovered, and have ideas too, but am praying for something to kind of come my way to start….i love renovating things…i love creating…ive seen a trailer for sell and have thought…but again the place its in…yet, how can i judge, as ive become so humble about life..
you’ve done a great job with your place, and thank you for sharing…these kind of things help others in ways you wouldn’t know…again, thank you. You have a beautiful home! ; ) and a beautiful dog! Your story and home are truly beautiful! Best wishes for a bright future! I love your house! I also live in a trailer that I painted pink, actually Italiano Rose! Reading of how your place looked when you moved in, I could really identify with. Mine was completely done over by putting in a new kitchen, carpeting/flooring, and painting throughout for the 4 colors of paneling. Good for you; glad you’re happy and have made a wonderful space for yourself and Cassi. You did a lovely job! When most of this planet lives in tiny, simple spaces by necessity and live with daily hardships of not enough money, it is so selfish of the western world to assume we are entitled to so much more. I applaud the fact that you’ve embraced your hardship and turned it into a new and rewarding life. Well done, it’s the sharing and compassionate attitude in action and I can’t help but think you and your pup will be better and happier for it, eventually! What’s that saying? What other people think of me is none of my concern…..
Well done. You could take this on as a business….fixing up trailers and reselling them……..very upmarket job. I’d live in it anyway. fabulous, wonderful, inspiring, creative, beautiful, resilient … wow. You and your trailer are amazing. I also love your writing style and voice. If you choose, I suspect a book could easily be in your future. Love your attitude and absolutely love your wee home. 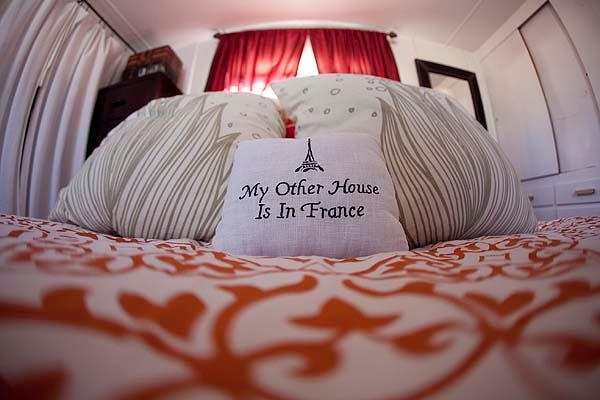 It is designed and decorated with such flair and I love the pillow…..France…..You have really hit the jackpot here and you are so encouraging. It’s wonderful to read about not only the changes in your pink home but also the journey you have made. Congratulations!!!! I, too, have done the trailer park thing a few times in my life, and every experience was more than pleasant, even rewarding: the first of my homes was a 1959 New Moon, 10X45, and it was just perfect for me and my baby (I, too, was newly single), with a SUNNY bedroom at one end, a smaller (think large closet) bedroom in the middle which was perfect for my son’s crib, a tall chest of drawers and a football-shaped toybox, and the front ‘half’ of the trailer being the living room and the kitchen, with an abundance of windows on three sides where I put my vintage chrome-and-cracked-ice table. During the years we lived there every wall, every floor -even every outlet and switchplate!- had been modified or replaced. It had become an adorable white with black-trim little home, with a shaded patio out front painted brick red underneath a well-used picnic table set. WHen my son was 5, we moved to a larger mobile home (1971 Victorian), its layout almost identical, just larger, a little newer, and a couple extra rooms/bigger bath, in the middle. Same process, built a custom deck, planted a decorative tree to (eventually) shade the south-facing floor-to-ceiling kitchen windows and peony bushes, all lush and full by the time we moved again 5 years later, and I refinished and painted the walls, kitchen cupboards, even removed a whole panelled counter-to-ceiling section that separated the living room from the kitchen, allowing all that bright sunshine to flood into the newly white-washed walls, matchstick blinds, over-windows white shelving and generally shabby chic decor of the living room now (where it had initially been the same dark 1971 panelling and huge suspended orange glass orbs of lighting in the corner it had come from the factory with, bleahhh!). The ONLY downside to living in a mobile home is the ‘living in a mobile home park’. Even the ‘nice ones’ seem to attract some of the worst types of people. I learned something important, and so did my son: there were poor people who had to live there because it was ‘cheaper than an apartment’, but took care of their lot and home, even spent many long hours making it beautiful, and 90% of that by the sweat of their brow, their labor and pride. Ahhh. The trailer park was the ONLY reason I am not still living in a trailer to this day. Typically, even the manager of the ‘nice’ parks will not care that you have a complaint (when I told them of MY problems, I was accused, first, of being ‘possessive’ of park property – that I rented the pad my trailer was on, and that the lot itself was NOT MINE to keep any neighbor from doing whatever they wanted to on – and, second, that I “must hate children”, etc. Its strange, and kind of backwards, but most I’ve rented a lot from fall in this category of ‘non-concern’. You would THINK park managers would want to take better care of their ‘good’ tenants (those who take care of their home, the lot, try to beautify an area… I even MOWED the yard of an empty trailer next to me, for several months one summer, keeping the lot picked up and neat, on my own time and action. Instead, the noisy, destructive and, often, dangerous, tenants stay on, while the ‘caretakers’ among us end up moving away out of sheer frustration. I’ve been back through the old parks, several times over the years. It seems the first thing the ‘new’ owner did was, in BOTH CASES (really odd), paint the pretty white-with-black-trim exteriors the pukiest shade of greige (grey plus beige, not taupe, this is something else altogether) with chocolate brown accents. The natural wood of the deck (and the red brick of the patio) were painted BROWN, too. They uprooted the seven year old ornamental Cherry tree AND the peonies (those things take YEARS to grow before they even start to bloom!) as well as any and all of the other decorative plantings I had spent hours upon hours taking care of… in both cases, the lots are now barren, empty rectangles of driveway-shed-and-grass/weeds now. It’s as if the managers/new tenants WANT their trailer/park to look as unkempt and unhappy as most people would EXPECT them to be! A few years back there was a show on HGTV (NOT the comedy thing that was on the comedy channel – or was it MTV?) that was like ‘Extreme Home Makeover’ but it involved making-over people’s ‘problem’ mobile homes, tackling space constraints, design, whatever. I LOVED IT! But it seems it was shortlived, maybe 4 or 5 episodes, and I never heard of anything like it (or even about IT). That’s a shame, too. Turning something – anything, from a repurposed cargo container or grain bin, into a ‘home’ is ABSOLUTELY something that can be made to be BEAUTIFUL (or charming, handsome, attractive, whatever) without a huge expense involved! ANd regardless of whether the dweller is poor, or wealthy, said ‘home’ can be kept neat, sharp and well-maintained. ALL IT TAKES IS A LITTLE PRIDE of OWNERSHIP. Some people just don’t have it, and they demonstrate this in many neighborhoods, poor AND wealthy. It’s just that the ‘trailer park’ seems to be where a disproportionate amount of ‘these’ folk turn up. PS: (LOL)… Rebecca, I LOVED your story, and your little treasure of a home. I think it’s far preferable than living in an apartment of the same square footage… Your pics show just how much YOU love your little home, and you should be very proud. Not everyone can be so fortunate, in that you had something so ‘customizable’ to work with, with a lot of ‘character’ already built in! Just wanted to say, your writing style on the subject was dead on. You write with passion. You should use this talent somewhere everyone can enjoy. Leap! You will not fall. And if you do stumble, it will just be a scraped knee, then try all over again. Blessings. Thank you, Jipsi. Yes, so much good came from that lousy year. I am in a much better place now. Emotionally and physically! I think your post really drives a vital point home and that is, it really doesn’t matter WHAT the residential structure is, it’s the individual creativity that makes it a home! Love your story! Really love your home! NOTE: The first home I was ever blessed to own was a mobile home and I could not have been any happier in it nor prouder of it. Best home in the world is the one that is PAID FOR! Say amen! Fabulous! With your kind of eye for decorating and all the comments here, I think you have a new career, too. Creative consulting! Thank you for sharing the pics… what an inspiration for everyone! Congratulations on your redo, of yourself and your trailer! Beautiful job! Inspirational,….. did I spell that right? Great decorating, and I’m the log cabin on wheels type. But I can tell when someone puts love and spirit in their new home, awesome job. My wife and I are also downsizing due to life changes (income, loss of job). A new beginning, a brighter tomorrow, currently its raining, but it cannot rain rain forever can it? Noah knew that. Build that Ark! In the face of many storms is the strength of strong sailors. Build a stronger ship with faith and love. We have 33 years of seas sailed (life challenges) together my wife and I. With a strong will I’ve studied information about logs and trailer frames, we’ll be building our log cabin on wheels soon. 6inch White Cedar logs, which we purchased turned to within 1/8 inch end to end. Built a jig to cut to double D. A salvaged front door from a friend, a old vented door purchased at a Restore. Our Ark. Remember, our dogs love us unconditionally. And what is it that catz do? Oh well, starting over. Maybe I’ll write an article on that for tiny house blog, we’ll take pictures. Will do. 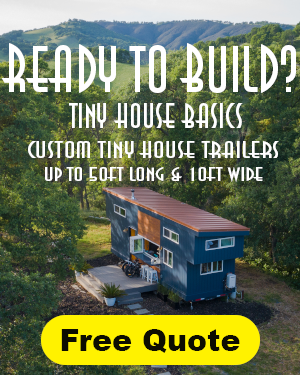 Tiny house blog and its contributors have been opening the doors.I’m installing them. (in my Cabin). KEEP ON DOING WHAT YOU DO! We appreciate the info! What an inspiration! I’m trying to part with the house that I built and downsize. I need motivation and friends that are in this lifestyle. I hate being house poor and stuck in one spot. Thanks again for a great story!!!! Wonderful article, redo and inspiration piece. Congrats on your new home and life! 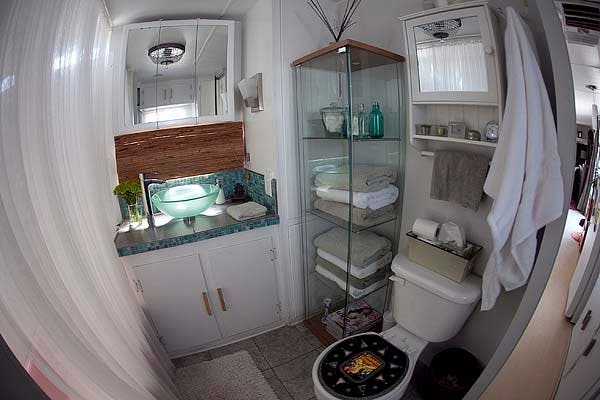 I hope to see more of an interest in quality clean and well kept trailer living, the type and kind that takes the stigma away from this lifestyle. I have a story myself, maybe one day I will choose to share. Trailer living, especially in these days and perilous times is the ‘new chic living’. Aren’t we lucky that we are the first to re-discover the joy of living light and unhindered by too many things. Downsizing by force or choice is absolutely liberating! Good health, peace and happiness to all reading. What a blessing to read your story.. You are the prove that anyone can turn troubles into blessings and happiness! goodluck for your future! I am excited to see your evolution 🙂 take care! I have nothing to add here that has not already been said. Great work and thank you for sharing. This is the most comments I’ve seen on this blog. You are certainly an ispiration! FYI-I love pink. This is a great example of upcycling! We don’t always need new. Using what you have is the challenge and creating style out of it is what I consider having the real talent. Fabulous. I am just building a container home–I 40ft for living in and another for a gallery/atelier space. Your gorgeous reno helps me know that what I dream of will work!! Thank you. Wonderful story, very inspiring and uplifting. I’m amazed by how beautiful you managed to make your trailer. I wish you the best, and good luck! Simply lovely, Rebecca. Best of luck to you! Your post really touched me. I bought the 1972 manufactured home that I had been renting for several years. I really had wanted to buy a house, but couldn’t handle being in debt again. I have embraced sustainability as a life style. My place isn’t tiny by the standard of your place, but it certainly is smaller than the homes that most of my friends live in. Your place looks beautiful! Amazing transformation. Brava! Thanks so much for sharing a part of your story and your living space. You truly are an inspiration. I wish for only the best for you in your life ahead. Hugs! Great job, good for you! I now (at 73) have a new hero, you. You so easily could have done what the current Government wants you to do and that is to turn to the Government for your help financially, emotionally etc. but you did not. My admiration for you also includes that you have done to your “new” home, it’s beautiful and shows not only beauty but also practicality. None of us know what the future holds but I am confident that whatever it holds for you – you will be able to handle it because you are a fighter not a quitter, although at times it may have been a thought. Perhaps your husband left because he could not stand the thought of his “failure(s)” through being unemployed and no longer being “the man of the house” “breadwinner” or other cliche etc. It might have been for other reasons but none of which should lead you the assume responsibility fo his departure. Move on, you are young, talented, beautiful and courageous, not to mentioon dedicated (to your dog friend). Keep your chin up, you are a shining example to many, including this old man. Thank you, Don! I really appreciate your kind words. congratulations on coming out “on the other side”. We have similar stories, and if the experience doesn’t kill you, it will definitely make you stronger. Tiny houses really are the BEST! We are where we are supposed to be…a Home is not defined by the Walls that hold it up…it is made by The Home we choose to make it. I like what you’ve been able to accomplish with the help of friends here…that is what makes it special…the Friendships. That’s what makes it a Home…the Friendships and Family shared and enjoyed. Best to you always. Look for the bright side…and it will show. I agree with Tinystoresrock…absolutely inspiring. I have renovated a tiny trailer in Fairbanks, AK and know what it’s like to make a silk purse from a sows ear! I too, know what it’s like to “reinvent” your life after devastation has left you dented. But, you didn’t break and that is the main thing. The furniture and photos are A+. I didn’t have the room you did but if I had, look out! You should be so very proud of being able to do what you did. In other words, this “rocks”!! Woman, I hear you roar! You are an inspiration and your home looks wonderful. It sounds like you were walking around letting life happen to you. When you had enough you stepped back into your personal power and it shows. Making the best with what you have. You just may be the person your dog thinks you are!!! I LOVE everything about your story and your home. You absolutely rock, girl! You inspire me. Similar story. Your home is beautiful! Your home is absolutely beautiful. I am impressed by your amazing attitude to move forward. I am in a similar situation and would be thrilled with such a great opportunity. Go Sister! Cute, was thinking of this myself, I work 2-5 day, 10 hour night shifts a month 200 miles from my permanent residence and was thinking of a little travel trailer too. I have a Bernese Mt. Dog which makes it a challenge renting. Plus if it is truly mobile, may come in handy if I want to move it to certain ski areas to spend a week or two. 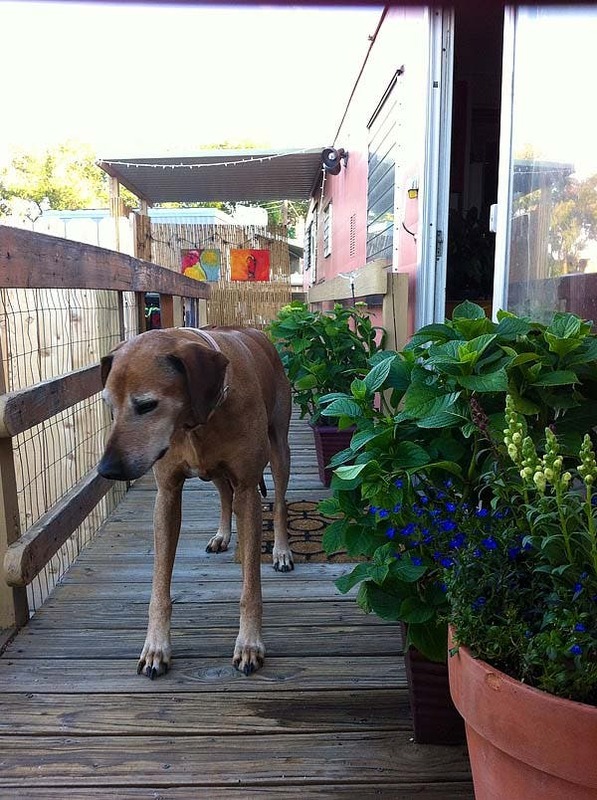 Good luck, you have made your place into a little heaven for you and your canine companion to heal. Thank you. That was a wonderful post and an inspiration to everyone confronting head-on the unfortunate realities that are facing so many people in our country. My story is also a cascade of events mirroring your own and thankfully also including a coming to terms with, and joyfully embracing the living of a sustainable life with a great deal of pride. I am a few weeks away from completing a 192 sq.ft. 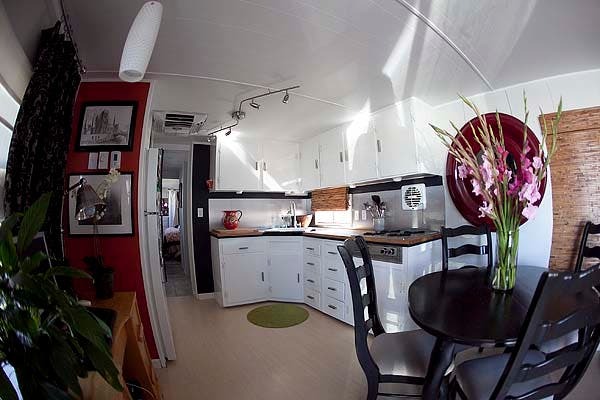 all-climate full-time mobile cottage built on a 26′ travel trailer frame. Also a few weeks away from starting construction on a larger production model version, as I am starting a company to serve people like us. It feels good. It feels right. I too live in a trailer but am still in the denial stage. It is awful! I don’t have the resources to overhaul it and do what you’ve done inside, but am so inspired, I might have to try. What a lovely space you’ve made for yourself and Cassi. I love your pink trailer in the ghetto. Love and creativity are worth more than gold and rubies. Enjoy the FREEDOM from it all. Inspirational story, beautiful, beautiful place, and such a sense of humor you have to share. Nice dog too! Your home is beautiful. Thank you for sharing your story, very inspiring. I have neighbors who moved into a trailer. I’m thinking about it down the line. My husband & I are getting up in age & I think a trailer home would be perfect for us. All on one level, etc. God bless you and your fur baby. When my husband and I got divorced I moved out of our 3500 square foot house into a 170 sq ft Airstream… with two dogs and two cats. That was 13 years ago. I’ve since pulled the Airstream to 48 states. I’m so much happier in my 170 sf than I was in that 3500 sf “dream house” The original dogs and cats are gone, but I have 3 dogs now. I’m posting from a beautiful campground on the Idaho/Washington border…. heading west. This is a beautifully written article. I feel every word. You MUST take THIS (the whole enchilada!) as the best thing that could have ever happened to you. You are SO lucky.. what a beautiful space (and doggie). Thank you SO much for sharing this! You puppy and your pink trailer are precious!! I love your trailor, wow, it is so very cute and beautiful an inspiration . Oh yeah love it. How inspiring all of the positives coming from negatives. I am in the process of downsizing out of sheer desire – what bachelor living in the rurals of NE Ga. needs 1256sf to keep clean, with three dogs/4 cats. I am so sorry that everything happened to you and Cassi(what a beautiful dog) as it did. This economy stinks for everyone but the wealthy–and there is nothing wrong with living in a trailer. If you do as your pictures show,take care of it, tend it well, then it is a home, a place to love, not something someone should sneer at. You did brilliantly–your space looks warm, happy(love the flowers) and personable. You put yourself into that little pink trailer, and made it your own. Good going! your place is just beautifully done! the proof that you can have a small place and still have style and good taste! good luck to you! Your trailer looks fantastic, and good for you for moving on and healing! Making a home can sometimes be just what the doctor ordered. The way things are going, I could be end up being your neighbor any time. Keep an eye out for another deal for ME! Your place is adorable – hold your head up high for being a survivor and making such a wonderful oasis for yourself! You did a fantastic job of being able to see the beauty is something so old and rundown. You should be proud. This place is now a GREAT place for you and Cassi. your sentence… I made the decision to look to the future with hope and joy….made me tear up…that is what life is about…making a decision…congratulations on taking time to heal your heart and so glad you had your pup to help you with that…and learning the gift of simplicity…brilliant!!! Omg. No need to say “you go girl” because you did. Ml from just outside of toronto canada aka the centre of the universe. I love it! This is what I’m planning in the near future, due to no pension. I think it was my destiny, and you’ve proved it can be all you want to make it! Get tough or get out of the way. You had your cry and got on with it and did what you had to do. I don’t even know you (wish I did) but I’m proud of you ! I would say, “Go Girl”, but that would be demeaning….you are THE woman. You’ll always come out on top. Don’t let the baztards grind you down. Rebecca ! Just beautiful! My story is somewhat similar except I put mine on ten acres so we could also run our businesses from home. (we are that new breed of oldies but goodies, the “working-retired”). As soon as I get rid of this dialup and my Sat. internet gets installed next weekend I will be doing an article on our story. OMG!!! You are AWESOME! As one who also had her world turned upside-down in 2010, I applaud you. I am so glad that you got to keep your beloved Cassie, that my eyes are welling up as I write this. There is absolutely no shame in living in a trailer. Some trailer parks around here (Baltimore County, Maryland) are really great places to live. Some are even on the water. My husband and I plan to do just what you did one day. Your little palace is divine. I think I’m going to have to download some of these photos as inspiration! I live in almost 4000 feet now (1000 and a bath for each of the 4 of us who live here) and every time I drive by the pristine little trailer park on the other side of town I’m jealous. I lived in a trailer (not a doublewide but a real 1954 trailer) that was super efficient with beautiful solid wood paneling and tons of storage. I was in college and the $150 /mo rent was tough to pay sometimes and t thrived on ramen noodles but it was the happiest place ever with a comforting cosiness I can only dream if now. In fact I probably will dream about it tonight since you made me think about it so much. Thank you! You are one Smart Cookie! Remember, ‘the best revenge is to live well’, modestly, truthfully, and wisely. We all need to downsize our “Stuff” I was forced into my ‘tiny house’ last year when I was booted out of my 1,400′ Home. I lost, had stolen, or was swindled out of my Home, its contents, my tools, and much more. I have my kitty “Zanzibar”, my car, and a few precious possessions I rescued. I now live 13 floors above the Earth,on a Summer’s eve I can see some glorious Sunsets. Late into the night I have seen Huge Lightening storms out on the Ocean 25 miles away going on for hours. I only miss my dishwasher, but this too shall pass. Strong women Rule! We survive, we show others how to survive, and we do it without an ‘Owners Manual’. Kudos to you and thanks for posting this. It is a great help to people to know it can happily be done. You are an inspiration to us all. Good luck and many happy wishes to you and Cassi. inspiring-just what i needed to read now. thanks for sharing your story. What a nice home you have…and YOU OWN IT!! You are WAY better off than most of your friends who you thought might not think well of your choice of homes. This is a triumph. You are a good example. You made the right choice and should be proud and happy. I applaud not just your ability to design a space (& one that you obviously had challenges with)to fit your life & style, but also your ability to adapt, to change & remain a resilient figure in the harsh biting winds of life’s unexpected obstacles. Stand tall, stay strong & NEVER let life take too much from you! Stunning! Somewhat jealous. I’ve had inclinations to do same. But we did downscale. And while I’d always jokingly said that we were contributing to the community reclamation of Dallas, I hadn’t realized just how ‘spot on’ I was. Your heart will heal in the beautiful, classic styled and creative home you’ve made with the great support of friends. You will find yourself and soon believe you are the incredible person your dog always knew you were. Some day you’ll look back at this new journey and know although it was painfully difficult, you learned more about life and about yourself than you ever thought possible. This is the perfect time to take up journal long or sketching, something to let your creative energy flow. 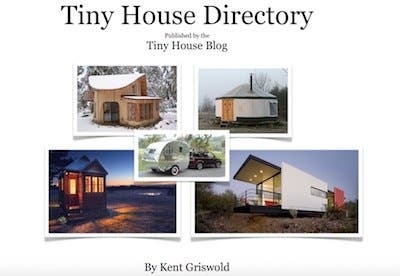 I sent an e-mail to Kent on the tiny house blog…You have done a marvelous job recreating that old pink darling. But you have done the best job by thinking and having the decency to rise above a very bad situation..
Keeping your gift from God..your DOG ..
May you my dear woman,find everything on Earth you could hope for ! And may your dog live a long healthy life with you!!!! Great job Rebecca! It’s adorable… All the little touches make it sing! But once people see the inside they want to stay for tea, or build a Grumman conversion of their very own. Love the pink! Keep yer spirits high, you are on the leading edge! WOW! I love that you have learned to heal and to take a lemon and make it into a wonderful home. we still live in a quazzi lemon…. a 1972 starcraft RV that we have gutted and partly refinished the interior the way we would have loved it… But my husband, myself and 2 cats, several finches and 2 ‘tiels and a rat all live in 165 sq feet…. We recently had dinner in the “cottage” with 2 friends… it was tight but it worked out great! hi, if you get a chance to respond my husband and i would like to know if you literally did all the work to rehab your darling trailer or if there are people who do that kind of work regularly? your choosing to live with your cute doggy in your beautiful home and possibly eat popsicles all day is a grand idea! I had a hand in all the work that was done to the trailer, but I had lots of help from friends. I did not hire any contractors, or pay anything for any of the renovations, other than the materials. I had never done this sort of thing before, and really am not very handy. But a vision and lots of determination seemed to make up for my lack of experience. Hello, You ought to be really proud of all your effort it took to transform your little trailer. I absolutely love it and think it looks fantastic. Congratulations on creating your wonderful space after such hardship. I just love your camper. I have one I downsides in and just love it. I have been looking for ideas on how to update it and your photos are perfect. I have a long way to go to get it updated but it’s just me and my pets and I love living in my camper. Thanks for the great remodeling ideas. Good for you! I went through a similar situation a few years ago. I thought I wasn’t going to make it. then I found a little mobile home in a beautiful park in the mountains. I talked the owner into accepting a down payment and letting me pay it off. I just make my last payment and I am fixing it up just the way I want it. I feel a great sense of accomplishment and I am sure you do as well. I have two dogs and we are all so happy here. What state are you living in Ginger? Rebecca you are a JEM of a person. Your home is lovely and shows good taste and hard work. The best to you & Cassie in the future. Wow, you did an amazing job! I love it! Way to GO girl!! You’ve made a completely unique and individual statement in a beautiful way…your own home sweet home!! Home, is not defined by bricks & mortar…as you’ve clearly shown…it’s about the individual(s) who reside there…you & Cassie in this case…fantastic souls, both! Keep on inspiring as you do…you’re an amazingly resiliant and resourceful lady! You go girl. I lived in a very nice trailer for a few years when I first moved to Florida and I loved it. I understand the stigma of living in a trailer. But it is different in Florida, its a lifestyle. I got married and moved into my wife’s home. We are upside down in the mortgage and I feel trapped. I was much happier in my trailer. Unfortunately, my wife won’t consider it and needs the foundation attached to the ground. Trailers are considered worthless by banks and snobs. The rest of us call them home. We recycled an old doublewide, also with dark paneling, cabinetry, and shag carpeting. We had it moved to our seven acres and aimed the picture windows north at the sweeping mountain view. A pale sandy yellow faux finish paint job covered the paneling and transformed the dark “man cave” interior into a bright day lit space. Cabinets were painted a pale teal or richer version of the yellow/tan. It appears your budget was a bit more generous than ours, as we ran out of cash before finishing the floors. I ended up painting the floors, and covering the inconsistent surfaces with rugs. While not the Ritz, it is airy and liveable–sort of ‘shabby chic’. My only problem with the trailer house is the “orange juice can” feeling in high winds. One big storm and it’s all over but the shouting. And while the disdain of the people with the big stick houses is hard to take, I feel sorry for them because they have views of their next door neighbors’ ugly too-big houses on tiny city lots. I prefer my small house on the big acreage where we can have huge gardens, outbuildings, and privacy. Beautiful reno job and great work on the healing aspect. Be proud of yourself every day that you took charge of your life and made it better! I had to shed (pun intended) a few tears when I read your story. Mine is similar, except the break-up was with my employer of twenty-six years. And I sold my lakefront condo to move into my clam shack, which I had bought for vacations. It is located in the trailer section of an upscale tourist town. My cabin is not in a rental park. The area was platted for clam diggers to park their trailers and originally no residence was allowed. But then a city was formed and the mistakes they made resulted in the unusual circumstance that now residence is okay, even in a travel trailer(!) on these private properties. And my cabin is protected by a non-conforming structure law. It has been a challenge to get used to the people who come to live in this neighborhood, and the business climate is marginal due to the snobby nature of the retired big-house dwellers who dominate the voting. They would prefer that everyone else simply go away. But my pup and I can walk to everything, inluding the beach, and my little estate holds all my toys (though it is a puzzle), and it is all mine. And I love the tourist atmosphere! The Harley event is here this weekend and the music and motor noise is invigorating! Thanks for your story. I sooooo identify with each step of your progress. May I ask where you live? Sounds idyllic! Are there other similar places across the country that you know of? It is a wonderful thing to see three lives have a new beginning! Your reno has me dreaming of doing the same. Thank you for your inspiration and willingness to share. Do you mind sharing info? What is the size of your trailer. What is a realistic reno budget? You are my inspiration. I plan to hit the parks next and do drive throughs, looking for “For Sale” signs. Again, thanks a mil and may God Bless all you set your hands to in your new journey. Sorry, Jerrell, I replied to the wrong spot. But this is what I was saying…. Thank you!! My trailer is 10×50, which in actuality means about 450 square feet of living space. I paid $5,000 for my trailer, but could have found one cheaper – I have a few friends who have found some major fixer-uppers for free. But I was on a very tight time-frame. And I put about $5,000 in renovations into the trailer and yard over the following year. I hope everything goes well for your new, fresh start! Who knows, maybe I’ll purchase some land outside Houston and start a Vintage Trailer park? I know it will take a while for our hearts to heal, but truly…. the whole world is our oyster! I have been amazed at this…at 58 I have been going thru a divorce for the last 2 1/2 yrs from a very abusive marriage of 40 yrs. I just picked up & left Christmas eve 2009 with a change of clothes, a few of my rescue dogs & $20 in my wallet, leaving my husband living in our 5 bedroom home we have lived in for the last 33 yrs. I was never “allowed” to work outside the home, so I find myself with very little income, even though I have court ordered alimony which he rarely pays, a serious heart condition which is as my cardioligist told me, will eventually have a valve replaced on the left side of my heart. 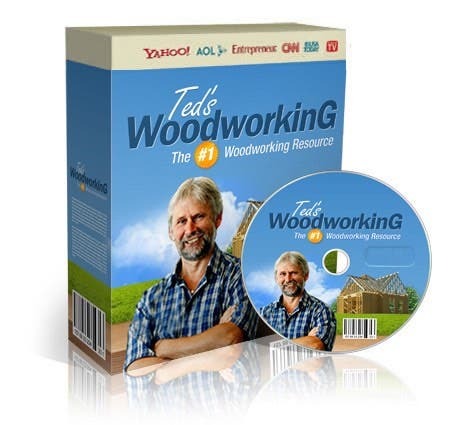 So far in 2012 he has not even payed what equals to 1 month (works out to about $150 a month). I have been living between my Mom’s & 2 of my 4 grown children who live states away. I am telling you all this to let you know how dire my circumstances have been for the last few years. A few yrs ago after deciding a tiny house would be perfect for me but coming face to face with the fact that even though my body use to tackle anything my mind wanted to do…my body is no longer capable of doing all the things I use to do. The more looking & reading I did, I eventually ran across people who had renovated different vintage campers & mobile homes, etc & made them their homes. I decided I wanted to find a larger Spartan that was made to be hooked up to electricity & sewer, not the ones that were towed around. I have been searching constantly…every time I found one that I felt like I could scrape $$ together for, it would be too far away or in terrible shape…if it was in decent shape, I could never come up with the money. Today that long search ended…I just this afternoon paid for a 1957 Spartan Executive Manor with money I scraped together by selling every piece of jewelry I owned except a ring & necklace my deceased Dad gave me growing up. I have $40 to my name right now but after the long search I have the title to my future home, which for the first time in my life at 58 will be something I own (my husband never let my name be on anything we had). I found it on Craigslist for $2000 but I have seen them a lot cheaper, just not near me. I looked not only there but lots of other sites that sell vintage trailers/mobile homes, local papers, facebook pages that list vintage trailers & Ebay…how I found mine is by using “searchtempest” which lets you search all of Craigslist. Sometimes even on the free section of craigslist. I’ve fallen a long way from living in a huge home, having 4 children all go to private school, driving nice cars, being members at the country club…the price I had to pay for living that kind of life was emotional, mental, physical & sexual abuse, a life of being completely controlled…a price I could no longer afford to or was willing to pay. I finally had the strength to stay gone this time when I left…it only took me 40 years. I am miserable most of the time but still have a lot of hope that somehow things will work out. Now to figure out how how to afford to renovate & somewhere to put her that I can live with. This story made me tear up for two reasons. First, life can be so obnoxiously unfair and unpredictable and it’s a beautiful event when someone powers thru it. Second, it’s wonderful to hear about folks realizing the simple life, the simple pleasures, and debunking stigmas that go along with it. There is so much more to life when we have less. Thank you for sharing, truly inspirational. I love it. You did an amazing job!! Love the 50’s pink. You should be very proud of yourself. Beautiful story and home! Thanks for sharing with us! I love what you have do with your place. I would be very proud of it too. This is truly inspirational. The only trailer I managed to find in the UK was on a park where animals were not permitted. No thanks! Great job on this: hope you have happy times there, good luck with the hydrangea on the porch, I love those plants. Many blessings to you girlfriend! Our stories are so similar, and I recently moved back to the city I call home. I bought a “trailer” in a mobile home park on a FABULOUS river path. It’s so convenient to everything, I’m back into riding my bike and walking everywhere! I don’t feel comfortable telling everyone that I live in a “trailer park”, but I’ve felt a wonderful sense of community here. Quality of life is what I’m after and I LOVE my single-wide! Congratulations for taking that big step…you’re definitely on the mend! Love the trailer and the story. Never knew that style of decor was possible. Very nice! I’m still kicking myself for passing on a 1957 Spartan Executive, in excellent shape, for $2500! Oh my, this is wonderful. The way it shows love and comfort. I also lived in a 10 by 55 years ago, and now wish I had it back. I will have to do some looking for a trailer myself, and see what I can find. As I am also 58 soon to be 59, and health keeps me from doing what I want, but when I set my mind to it, I get small things done, and then repent the next day in pain, but oh to live like you do and so lovely, yes I can say I will live in a trailer again. Great going girl! I love what you did with your home. It looks so neat and inviting. And you have decorated it beautifully. I would love to have a home just like it about five blocks from the beach in West Florida. I am inspired by your courage and fortitude. I wish you the very best going forward. 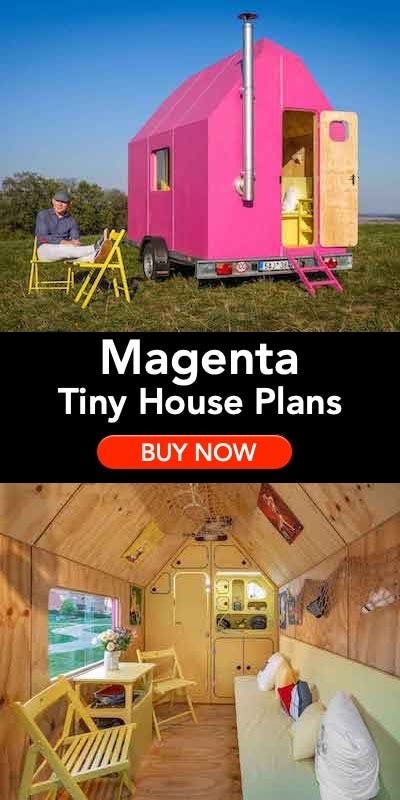 Nothing new to me about tiny homes. When I came home from the hospital, my crib was in a 2-story Stewart trailer. It was a 8’wide x 40 foot unit. For its time, it was HUGE. My brothers’ bunks were over each of the downstairs rear wheels; my parents bedroom was at the top of the stairs. My crib was in a short loft half-way up the stairs. It even had a built-in china corner cabinet and a front-loading washing machine. Yes, that’s right, a family of 5 in an 8 x 40. It can be done. Mobile homes shortly after WWII were towed by the homeowners with pick-up trucks or large cars, much like we do travel trailers today. How wonderful Rebecca! I am healing from a divorce and working towards a four year plan to build a beautiful small house about the size of yours and have the financial freedom to save more and travel. It’s just my dog and I and I can relate to your story. It’s stories like yours that keep me motivated. I was trying to read it to my dad and got choked up and he had to finish. I’m so happy for you. You’re little piece of heaven is beautiful. Love it, all the best. I love your story. I have a very similiar story. Congrats on your healing. Congrats on mine too! If I knew of a pink trailer, I would move too! Excellent resource! Love the 1954 Ventoura with loft! Alice, I actually know where a 1954 Ventoura is located. Just about a mile from me. Went inside once and could not believe the creative use of space and different levels. The “upstairs” bedrooms are small, just enough room for the bed. Really cool. I love this post, the story and the power of humanity to heal through simplifying. Uplifting! Great story, and what an absolutely great looking home. Not just a house, but a home. Keep on healing, keep on growing. Peace. Good for you! Simpler can be better. Unfetered os better. Your attitude is as beautiful as your home. Good for you! It’s reducing your housing costs by 2/3 or more…giving you loads of discretionary income or cutting your required work hours giving you a lot more freedom. It makes you ‘green’ in that you no longer have need for the massive utilities required to run a 2500 sq. ft. home. You no longer have a 30 year indenture/mortgage with a bank…those corrupt, greedy money lenders who took bail out money from the federal government…making you a rebel against corporate greed and mismanagement. Start saving money and in no time at all you’ll become the most independent and secure person at your high school reunion. There’s a new kind of cool in this country…and they don’t drive foreign luxury cars, or live in big homes…we don’t have mortgages…we are independent of the economy…We are the ‘Tiny Revolution’! I am so glad I ran across your post. I need to move into an old fifth wheel I own. It is a mess and I really did not have much hopes to be able to ever make it nice enough to not be depressing. But you have totally encouraged me by what you’ve accomplished. I am not real sure where to start (ceiling, floor, cabinets???). But I at least have hope that it will look nice and liveable when I’m done. thank you again. Survival of the fittest, I must say! I loove your success story. Your trailer is absolutely beautiful! Inspired!!! I’m in the process of getting a small trailer myself to have the flexibility to go where there is work. It’s been a challenge finding work at times at my hometown, so having a small trailer will give me the opportunity to work anywhere. Your home is beautiful, you have done a wonderful job. You should be very proud of it. Best of luck to you sweetie, you deserve to be the happiest you can be. We have sold our house and contents and will be travelling fulltime in our motorhome and when we quit we will find a piece of land and live in our motorhome. It really is all we need. Well you have made my day and night and I just can’t thank you enough for showing us and telling us how you made this trailer into your beautiful home. My husband and I never dreamed we would be living in our 20 year old motor home in what is called our “Golden Years”. I have to say it hasn’t been easy my husband’s health is not great and it can be depressing thinking we are in this situation after working all these years. After reading your story and looking at your trailer it has made me realize that some ideas I have had to do things around her differently could really make this a home. A motor home has a lot of loss space in front but by removing the passenger seat and using some low privacy bi folds plus some other ideas I have this could turn what is an old motor home into a very pretty little house for us and for one of us when the other has passed on. We do not drive it and its worth less in value than what we owe so why not make it ours in all aspects. I can not thank you enough it has given me a chance to look at our place in a whole different way. The best part – no mortgage! You are FREE to do whatever you want to do & I hope you pursue every.single.minute of it! Congrats! Awesome- love the camper and love how you have done it over! You are an inspiration and i thank you! I appreciate your willingness to share your life with us! As overcomers We are so fortunate to have been able to walk away and to own our trailer homes (many thanks to JOHN for pointing this out in his response) i realize now that if i change my perspectivei can be perfectly content!! Thank you and God bless!!!!!???? I love that you let your heart lead you to a simpler way of life and that your loyal friend Cassie was there for you, by your side, day by day, with unconditional love for you in your lovely home. Wishing you continued good fortune in life and love. communities that are really nice. as there are in other single resident home neighborhoods. when they are pretty much “permanently” fixed to their lot! ALl the best, this is so glam! Rock on. Peace and love to you. Years ago I bought a used mobile home (we called them trailers back then). It was already set up in a very nice park. My young daughter and I lived there happily for 4 years. Fortunately, I didn’t have to do anything to it — it was already in great shape. It had a nice big kitchen with space for a small dining room set. It had lots of counter space and two ovens built into the half-wall between the kitchen and living room. The living room was next and then a hall down one side with a small bedroom, space for a washer/dryer unit, bathroom, a medium-sized bedroom at the back end. I loved living in that trailer. If I could find a nice park here (Austin, TX) where the lot rent wasn’t as much as rent on an apartment and a similar mobile home, I’d move back into one in a heartbeat. I don’t think I’d be up for doing much work on one, however, but I think it’s great when people can do that sort of thing. Rebecca, you did a nice job and I think pink looks nice. Dear Rebecca – Your story should be told to anyone who is going through crisis. I am so inspired by you. You’ve come out on top. I love what you’ve done to your home and your life, and I just love your little chum, Cassie. I can’t tell you how impressed I am! Best of luck in the future. I LOVE your home! And it’s been fixed up VERY nicely!!! I lived the first 5 years of my marriage in a mobile home & loved it, especially since we lived so much cheaper than most of our friends who were throwing their rent away. Glad to see you & Cassi in such a lovely place. Thanks so much for sharing your story and the photos of your beautiful home! It’s outstanding! May you enjoy many, many happy years there. Oh, and you have nothing to be ashamed of! It’s YOURS! I’ve lived in large homes, and now 650sq ft senior living, and wouldn’t trade it for a larger space. And, like you, when we realize we are because of what we had/have gone through, we grow; grow also in a way that what others think; or think of us is none of our business. Good job, girl! Third!! You are quite an inspiration. And you are not only healing, you are growing! Congratulations for working through the sadness and getting to the other side. You sound like a wonderful and loving person….not to mention strong and resourceful!!! 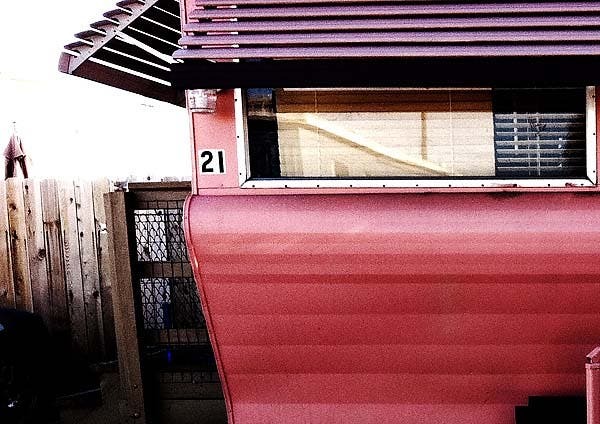 I especially love the new address, “a pink trailer in the ghetto”….ENJOY! I had no idea that a trailer could look so modern and welcoming. It is stylish, very livable, and it’s all yours. Congratulations for turning a bad situation into a great life!! Your pink trailer home is beautiful! You go, girlfriend! Congratulations! What area of the country are you in ? I am in Northern California. I love this idea. “Wow! I can’t believe this is a trailer!” Excellent design, excellent execution. Quick question: How was the work divided up? Who did what? I am a huge fan of retro trailers and adore the job you did on this little beauty. You should be very proud of yourself and your positive comeback from tough times. Your story made me smile! of remodeling to that. Congrat’s, enjoy, mend and love again. It’s not where you live; it’s HOW you live. You look and sound happy. No one can take your joy from you! We cannot always control what happens to us, or around us, but we can control our reaction to it. Enjoy your new space, both in your home and in your head. Wishing you the best of luck. I love your little home-it is so well decorated, and very homey. I too went thru a divorce that upended my life, and like you live with 2 very large dogs who kept me from being too depressed, so I relate to your uplifting story. I was disabled when he left, and since I could no longer work in veterinary medicine,started a small jewelry company that is flourishing. I live in a tiny house, on practically no money, that I painted bright banana yellow, and love my life now. Thank you for your inspirational story, and keep us posted. Wow! You traded up, girl, and your priorities are right on. You kept the best, including the dog, and you left behind the things that do not bring you joy. Bravo!! Beautiful and paid for…what more could a person want? You did a wonderful job. I think it is terriffic !!! Love what you did. I’ve often thought of moving from Southern California, but have no idea where to go. I don’t want another house, and no apartment. I’ve looked at Park Models, but nothing jumped out at me. I think you’ve got a real winner here. Cozy and just plain cute as hell! I live is small house, less than 1000 sq. ft. and I would never want to go bigger. A trailer is great if you live where it won’t blow apart, have some decent neighbors, and the lot rent isn’t out of site. Congrats…..you have a “one of a kind” home. I absolutely love your pink trailer! It reminds me of Barbara O’Neal’s book The All You Can Dream Buffet. These women at different stages in life buy trailers, fix them up, and mend their souls. I hope your soul continues to mend with Cassi by your side. Absolutely inspirational, Thank You. I can relate to your change of circumstance and admire your pluck. I have always loved trailers and want to live in one. My family thinks I am NUTSO. your home is lovely and YOU DID IT! Having started my life, and later my marriage in single wide trailers I have a special place in my heart for them. Where I live, the stigma is strong, for the most part, and people do live up to the steriotype in spades, but there are a couple of communities that are quite lovely and welcoming. My beloved grandmother downsized to a single wide in a park and her home is the most pleasant place. When motherhood overwhelms me I tease that I am going to stay in her front bedroom from a few days and drink chocolate milk and watch daytime TV with her. Some people want to flip houses, I think it would be fun to flip trailers…if the loan process and depreciation weren’t there. I call my 10X50 my little tin box. Mine needs re-doing. I’ve been in it 14 years and never missed a lot rent payment. Good luck. I’m looking into purchasing a 10 X 40 foot mobile home. Not sure what year it is, but it is from the 70’s. I’m looking forward to putting in a new floor, new windows, a new roof and insulated panels on the walls to cover with board and batten paneling. I will, then finally have my less than 400 sq. ft. home! Thanks for inspiration from what you have done! Your home is beautiful and you should be proud of your home. needing to remove them and reinstall in to order to correct the wiring! Also, Rebecca’s place looks so open and airy because it’s painted allover in very light colors. And not a lot of clutter. One thing I like about the older trailers is that whatever out-gassing the building materials used in them needed to do is all over with. So it does not reek of chemical odors. Visited some brand-new mobiles that had chemical odors beyond unpleasant. Seemed unlivable and unhealthy until the out-gassing happens in ?? months or years. and I wish that for you too (and all of us!). If I had a trailer that looks a gorgeous as yours does I would be very happy. Thank you for your article. I’ve thought the same about trailer parks but you have made a good transition and it looks great. Hope your dog has made it to and the anxiety (howling) has passed. Loved your description of the change. You did an amazing job- it looks more like a high-end spa than a trailer. I’d rather have a good dog than a bad husband, any day. So I think you came out ahead on that one. Just one question- did you replace the cabinets in the kitchen? Or just paint them? The whole trailer is so airy and light and beautiful. A friend of mine went through a similar experience (divorce) and lived for a couple of years in a single wide in the woods. 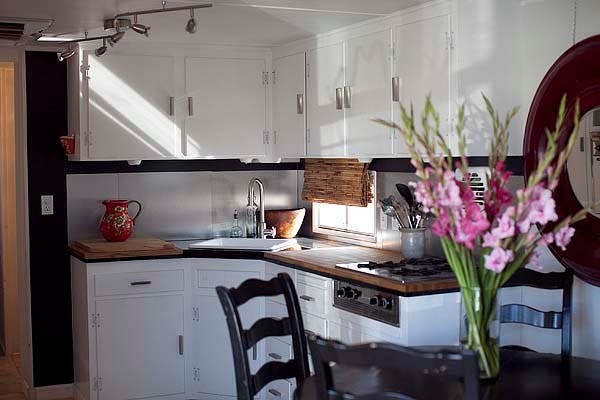 She gutted it, painted it white, made slipcovers for an old couch from canvas drop cloths, and ended up with a trailer that was the usual metal box on the outside, but a truly lovely, “Zen” place on the inside. As far as trailer parks go- I think more and more people are getting over the old “trailer trash” prejudice. There are two very nice Mobile Home parks where I live, and I have been in one in Newport Beach (CA) that was amazing. Of course the best thing would be to have a friend with property who would let you park on it. Plus- I have found that some of the people I thought were the roughest around the edges can actually turn out to be incredibly nice, helpful, and actually protective. Good luck to you and your nice dog! And congratulations on making yourself a wonderful home. I live in a mobile home as well in Las Vegas. It ain’t fancy, but it’s mine. After redecorating it it’s now my “castle”! We often get hung up on thinking we have to have the new and shinny and spend a lot of time working and sweating to get it. I love this story because it proves that less can some times be more than we ever would have dreamed it to be. There are things we can not control in life but this proves that we don’t have to spend our days feeling sorry for ourselves we can make the most of what we have and find a happy life. Way to go girl. Your home is lovely and you have not a thing to be ashamed of. God Bless and thank you for sharing with the rest of us. Your home is lovely, as are you and Cassi. I would submit that only the location of that trailer creates a stigma, and if in time you have resources, you could move to your own land, all three of you, and shed the stigma while retaining your beautiful home and all the work you put into it. May you be blessed with healing and happiness for many years to come. Beautiful job!!! It still amazes me how we come through life’s hardships with renewed strength and vitality. Your trailer is lovely. Who wouldn’t want to live in it? Continued success. Thanks so much for sharing your inspiring story. I divorced my husband of 25 years about five years ago and have significantly changed my life since that time. I have undergone the process of down-sizing, just as a natural part of changing my life in other areas, and I love it. I am getting ready to build a tiny home, which will be just under 400 sq. ft. I hope that mine turns out half as lovely as yours. Bravo to you for your courage and ingenuity! Bang up job you did! Many of us have found ourselves in similar situations. You just gotta make lemonade out of those lemons! And you did! I love this and your story. 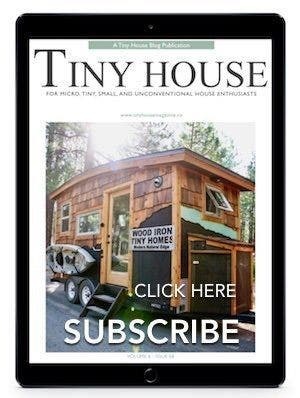 I have been following tiny house talk since Alex started it, but lately I haven’t seen anything on the blog very interesting to me. Seems like the stories of lately have gotten off track of what I’ve thought tinyhouse was about. Disillusion, disappointed, but hopeful. Tiny house s have been around for a long long time. For instance, the homes of Carmel. Beautiful fairytale cottages. And those are what started my intrest in tinyhouse. Kent, please find more stories like this. I liked that you had mentioned that finding the right model in the area actually hit perfectly and you found exactly what you were looking for. My wife and I have been looking at moving into a park and we aren’t really sure about what it will take to move in. With your optimism, we might have to start looking around at park models to find a great place to live that we can love as well! Wow – I’ve been crying & throwing up from being so upset for over 1 yr. – but seeing your pink & beautiful – gorgeous trailer has snapped me right out of my funk! I live in NJ & NJ has banned cesspools – so we can’t sell our house – my hubbie & I are well into our 60’s & he got a promo with his job to Fl. – he’s there waiting for me to handle bankruptcy/foreclosure papers as it costs over $130,000. to remove 3 perfectly good working cesspools & more $$$$ to install what they want – we don’t have that $$$ and house only worth lil more than that. Rather than ramble – thank you – you’ve changed our lives. We’ve bought a 2002 travel trailer & are fixing it up bit by bit. Yours is the most beautiful 1 I’ve ever seen!!!!!!! And I was embarrassed to admit we’ll be living in a trailer park – but after seeing your palace – the heck with that. I’m happy about my new home and our new lives – thanks to you. Wishing you & your dog many years of health, peace & prosperity. A good friend of mine told me that she was interested in getting a bed trailer. She wants to make sure that she is making a good decision for herself and a good overall investment. I think she would like knowing that she can make her space beautiful and impress guests.